More often than not the collections shown during New York Fashion Week: Men's are heavily trend based. Sneakers, bombers, oversized tees, we've seen it reworked a million ways and one. 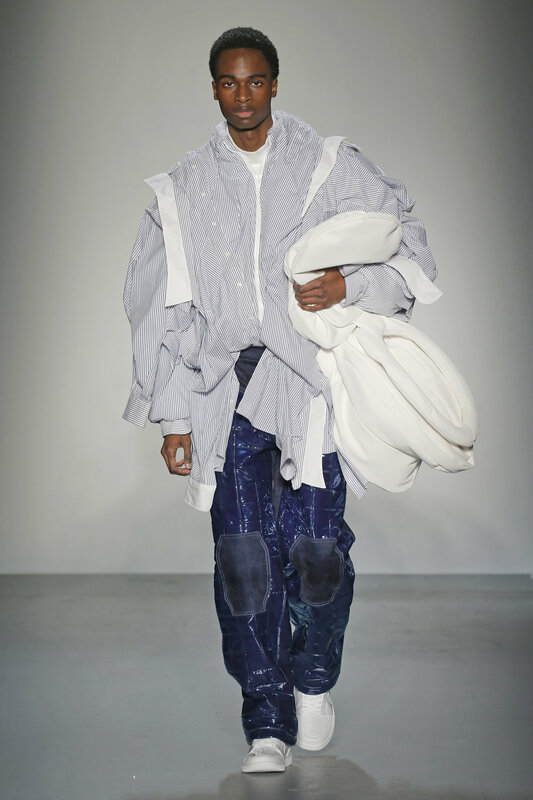 This is why it's particularly special when a designer like Feng Chen Wang converges upon New York to show a collection based on the conceptual principles of fashion rather than dispensing a buy-now, wear-now stockpile. Wang focuses her collections on art, construct and concept. For Fall/Winter 2018 the designer delivered a well appointed collection that easily blended wearability and concept. 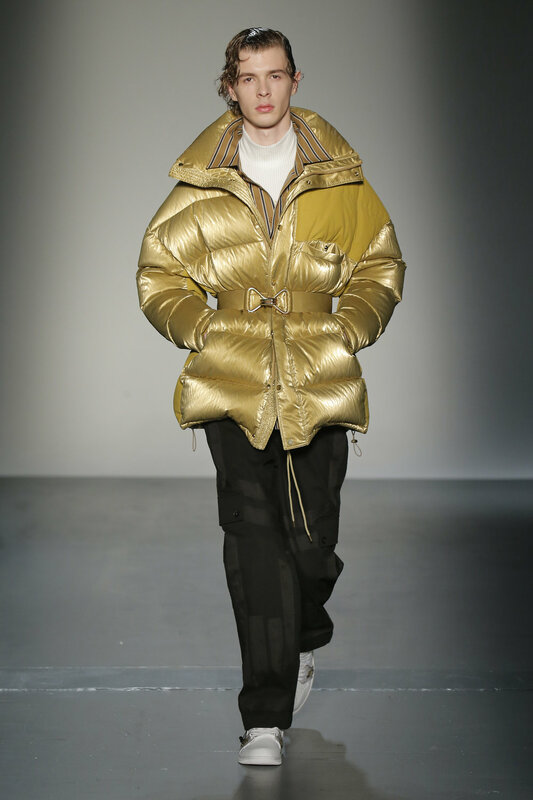 Playing with the idea of going home, including adorning the runway with a giant plush toilet and rotary phone, the designer debuted a collection that sent her man back to his latch-key youth, the 90's. Wide leg pants with tapered legs gave a contemporary twist to a classic 90's street style staple. Oversized proportions made heavy statements in sweaters and outerwear. 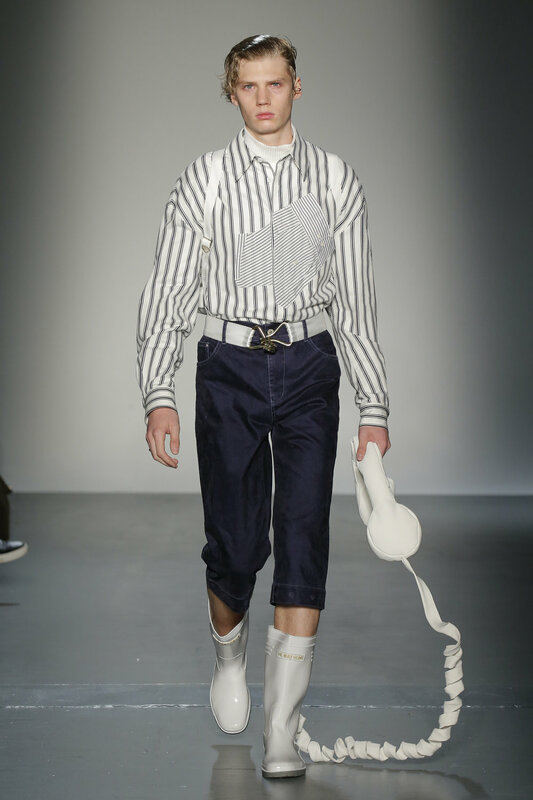 Blue patent accented dusters grazed the runway while heavy layering reached a peak with a jacket brilliantly constructed banker striped dress shirts. 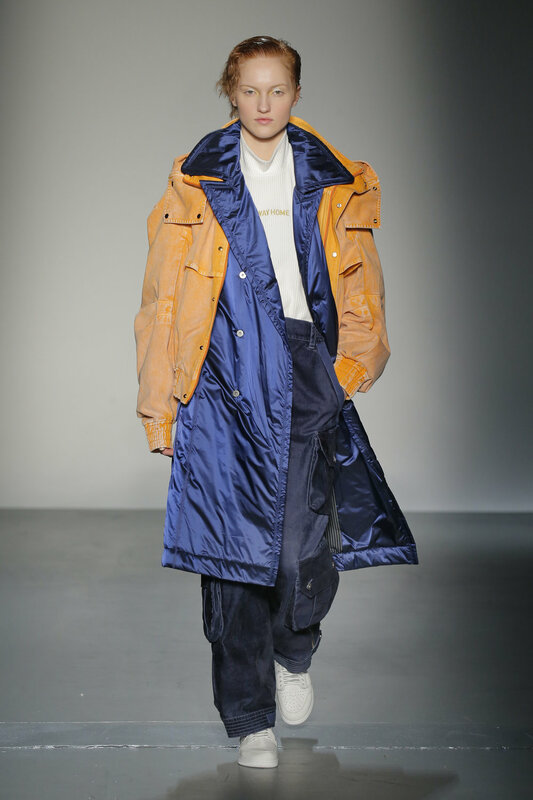 The acid washed orange denim field jacket and pants was a seasonal must have, that lead to the finale: a lustre orange, drop-shoulder, down jacket that is sure to be seen in the indie editorial pages this fall. Photos and video courtesy of Feng Chen Wang and by Jim Duran.